I came across a pricing strategy the other day that was truly genius. Its essentially a psychological pricing life hack that will instantly get a good percentage of your clients choosing higher end packages. 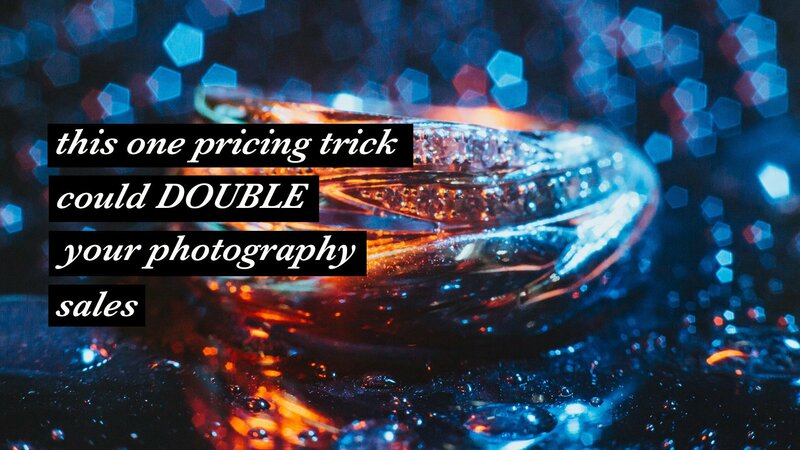 If you want to know how to price your photography for maximum sales, this is for you. Its called the decoy effect. Chances are you’ve never heard of it, but its almost a sure thing you’ve bought something because of it. Pretend you’re going to the movies. You buy your tickets and then get in line to buy yourself some delicious, buttery popcorn. The medium popcorn looks tempting, but its more than twice the price, and the small is already plenty big. Chances are that you, like most people, will opt for the small popcorn. Odds WAY more likely you’ll go with the large this time, because you’d be absolutely crazy to get the medium when you could have a large for only 50 cents extra. And that my friends, is the decoy effect. This is one simple pricing strategy that can make a HUGE difference in the average orders of your clients. When you think about it, my prices were encouraging clients to pay less instead of more. I was accidentally using the decoy effect in reverse! But what if we introduced the decoy effect the same way as our popcorn example? How many people are likely to book our middle option, when the our ultimate photography package is just $100 more? We haven’t changed anything except our middle option price, but now our average sale has gone from $1300 to $2600! To recap, the decoy effect is an amazing pricing strategy you should be using in your business. It works to increase your average sale by creating a decoy option in your pricing, which gives your customer a reason to spend a little bit more to get the value of your higher package. Can you see this working in how you set up your photography pricing? Why or why not? Love this idea! Will try it in my own pricing guide!! Thanks Mo! Excited to hear how it works for you! Clever, I will give it a go. Thank you!